If you’re looking at diversifying your retirement fund options, consider setting up a Silver IRA through a top-tier precious metals company today. The individual retirement account, or IRA, is an incredibly popular option for smart investors who are actively planning for their retirement years. And a silver IRA, or any retirement account that includes physical precious metals, delivers an even greater sense of security to those entering their golden years. If you value stability, long-term appreciation, and tangible wealth, a silver IRA may be right for you. Let’s first define the silver IRA. Simply put, a silver IRA acts just like a traditional individual retirement account, but instead of holding paper assets as the core of the investment, physical silver coins or bars are used. The silver is kept in an approved depository until the investor reaches retirement age. Then, the silver bullion is either liquidated or shipped to the individual. And just like a traditional IRA, the value of the portfolio can grow based on the price of silver. Unlike an investment in stocks or mutual funds, silver can’t go out of business and won’t declare bankruptcy. And rolling over an existing IRA into a silver individual retirement account is an IRS-approved and 100% tax free process. What Sets a Silver IRA Apart from Other Options? Silver is in high demand: From industrial applications in items like cell phones, flat-screen televisions, and medical instruments, to global demand for silver in jewelry production, this precious metal enjoys significant demand that should keep prices high for years to come. 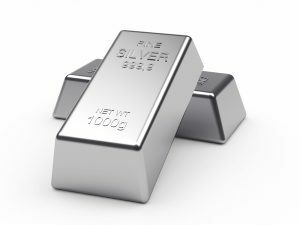 Silver is stable: The per-ounce price of pure silver has steadily climbed over the years, representing a solid investment choice for those looking for consistent, long-term gains. In fact, the price went up nearly ten-fold during the time period between 2001 and 2011. Silver, like gold, is in finite supply, and that equates to supply-side scarcity that can keep prices high for years to come. Silver will always have value: Unlike even the hottest share of stock, silver doesn’t run the risk of bankruptcy, an image problem, or internal financial concerns. Think anyone who invested heavily in Sears stock in 2007 (it was then the largest appliance retailer in the nation) feels good watching their shares drop from $191 per share to about $8 today? That type of shift doesn’t happen with silver…or any precious metals, when it comes down to it. You’re in charge: Many company-sponsored retirement programs give little flexibility in how they are invested. For instance, 401(k)s at many corporations effectively steer participants into target-date-style funds that offer little in the way of choice. Investors simply tell the brokerage when they plan to retire, and the firm creates a retirement scheme that balances risk versus reward. A silver IRA allows the investor to manage their retirement plan in a more intimate manner. *Silver individual retirement account rules are the same as what you’d find when investing in a traditional IRA. For example, regular annual contribution limits still apply with a silver IRA. *Any silver added to the IRA must be held under the supervision/management of a custodian, which generally means you can’t simply place silver coins or bars in a home safe when part of the IRA. *Only silver that is 99.9% pure (has a minimum fineness of .999) can be placed in the IRA. * When eligible, rollovers are allowed from other funds (like existing IRAs, 401(k)s, and 403(b)s.
If you’re considering a proven alternative to traditional investment options, contact the silver IRA specialists today at American Bullion. Our substantial experience creating powerful retirement accounts founded on silver, gold, platinum and other precious metals can help you better plan for your future and retire comfortably. Contact us today to discover more.